If you’re lucky enough to be one of the companies here in Silicon Valley that’s large enough to have your operations in more than one building, you know that the bigger you grow, the more logistical challenges you face. One of these challenges is that of moving people around from one part of your campus to another. The more buildings you have, and the further they are spread out from each other, the more of a challenge you will have to accomplish this. Some of your people will need to visit another office some of the time. If it’s a hassle for them to get from point A to point B, you’ll suffer from lost productivity and possibly even lower morale. In most parts of the country, the choice is pretty simple. You walk to the other office, or you drive a car if it’s too far. But here in San Francisco, where parking is hard to find and many of your employees don’t even have their car at the office, there’s a need for intercampus shuttles to move people from place to place. While you may see the benefit and convenience of implementing an intercampus shuttle, it may also just look like dollar bills flying out the window. So let’s look at the business case for implementing intercampus shuttles, starting with an example of a local business that has implemented this type of shuttle. Genentech has a highly coordinated system of transportation for employees, from last mile shuttles to intercampus shuttles. Their gRide Transit map shows all the transit routes that exist for people to get to work from around the city and across the bay. The intercampus shuttle makes sense for them because their campus has multiple buildings. They have implemented three different shuttle stops for their intercampus transport solution. There is about a two-minute drive between the first and the second stop, and there is about a six-minute drive between the second and third stop. What takes six minutes to drive would be a long and sweaty walk, especially in heels or other uncomfortable shoes. 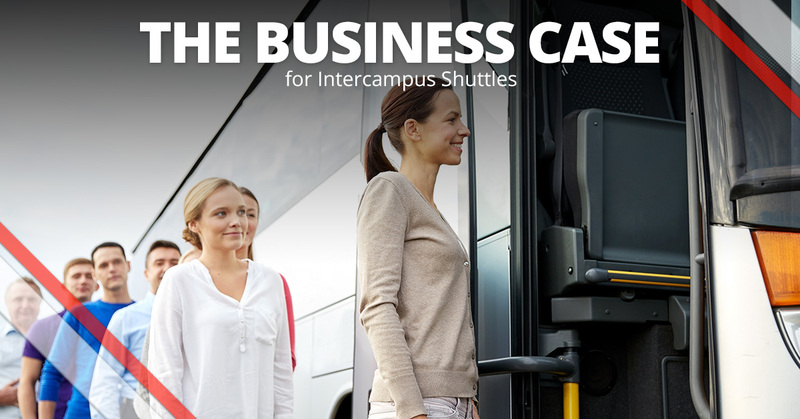 Do Intercampus Shuttles Make Sense For Your Business? For there to be a business case for any product or service, at the most basic level, your business goes better with it than without it. Things run more smoothly. You save more money. You keep more profit. People are happier. Productivity soars. Your reputation skyrockets. When you know that those things are true about the service you want to implement, you don’t mind paying a small amount of money for it. So here are some of the points that make a case for why your company should implement intercampus shuttles. You can implement intercampus shuttles on a contract basis, and when you first start, it may just feel like a line item in the budget. However, here’s what many companies don’t consider: If people already have to make trips to a separate building or a different campus, then you’re already paying the cost of those trips, whether you’ve implemented intercampus shuttles or not. You’re also paying in lost collaboration because it’s too much of a hurdle to simply swing by the other office. You may also be paying for it if you subsidize employee travel expenses as an employee perk. You may be paying the cost of an expensive parking lot space that could be reclaimed for better uses. If people are moving haphazardly from their worksite to another one of your company’s locations, you’re paying more than if you streamlined and simplified their travel. The main question is, do you want to leave it to chance how much you are paying? Or would you rather organize it and systematize it and get every element of intercampus travel under control so that you can keep it under budget? You might be surprised to discover how much you were actually paying before you implemented intercampus shuttles. Are you feeling like intercampus shuttles would lock you in to a certain timetable or create unnecessary waiting periods? You actually have more flexible options than you’d think. Here are the two main models that you can combine for the shuttle solution that works for you. A fixed intercampus shuttle is one that visits scheduled stops and runs on a predefined timetable. You can set up your fixed shuttle route to include the number of stops and the number of trips that fit with the number of trips between sites that your employees are likely to make. You don’t want to be burning unnecessary fuel by making too many trips on one hand, or keeping people from moving freely from place to place on the other hand. An on-demand shuttle option is one that comes to get passengers just when they need a ride. These shuttles are typically smaller vehicles (not large buses) because they will typically transport only one or two individuals at a time. With all the online tools that are available to us today, sometimes there’s no substitute for live, human-to-human contact and face-to-face communication. Your business ticks because people collaborate with each other, and the more that you can remove any barriers to collaboration, the better. Whether it’s a couple of executives from different sites who need to work together on goal setting, a facilities manager who needs to do a walkthrough of all your buildings on a regular basis, or a new hire who needs to attend a training class in a different building, people will need to move around at least some of the time. When you implement intercampus shuttles at your place of business, you’ll reap all the benefits that come with this solution. To get started, simply contact us and ask for a quote. We’ll help you to arrive at a custom solution that gives you the corporate transportation system you need. Contact us today!